Hiking trails with green gradation are suitable for beginners and requires no special skills or equipment. Mainly short walks. Tarmac, gravel, forest roads and good paths. Work done on paths to enable easy walking. Firm, even and obstruction-free path. No streams to be crossed. Elevation difference: less than 300 metres. Max length: 5 km. Moderate ascents, but no steep or difficult sections. Keiservarden. Photo credit: Terje Rakke. Beginners and walkers of average fitness. For hikers with basic hiking and outdoor skills. Similar to green trails, but can have more challenging sections. Can be rocky but no demanding scree. No streams to be crossed. Elevation difference: less than 600 metres. Max length: 10 km. Most ascents are moderate, but can include some steep slopes. Certain sections can be considered precipitous for some. Hiking in rugged mountains. Photo credit: Arne Sklett Larsen. 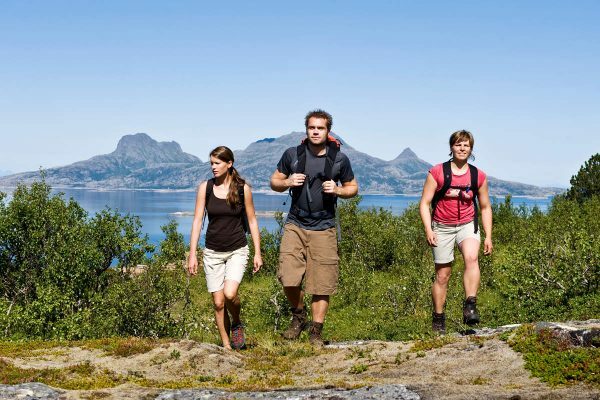 For experienced hikers in good physical shape and condition. These hikes require appropriate hiking equipment. Path, open terrain, rocky, scree and rugged mountains. Crossing streams, traversing steep slopes and long stretches of both loose rock and marshland. Up to two streams to be crossed. Elevation difference: less than 1000 metres. Max length: 20 km. Several types of ascents and challenges. Several precipitous and exposed sections. Can include technical challenges and parts that require some climbing. Exposed scrambling, Stetind. Photo credtit: Nordland Adventures. 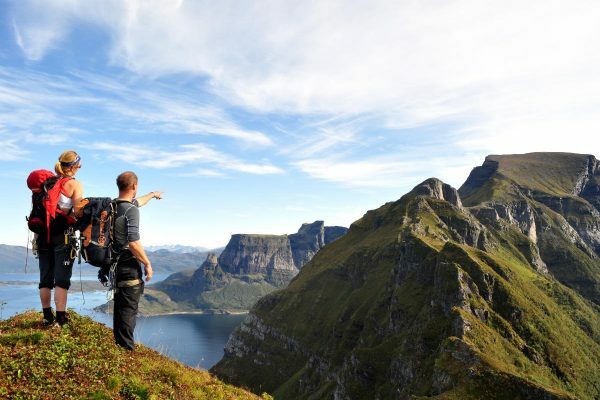 Hikes suitable for experienced mountaineers with good stamina. Hikers must be in good physical shape and condition. Good equipment and hiking boots required. Longer and more technical trails than “red”. Can include a number of streams to be crossed. No maximum. See description for the specific trip. 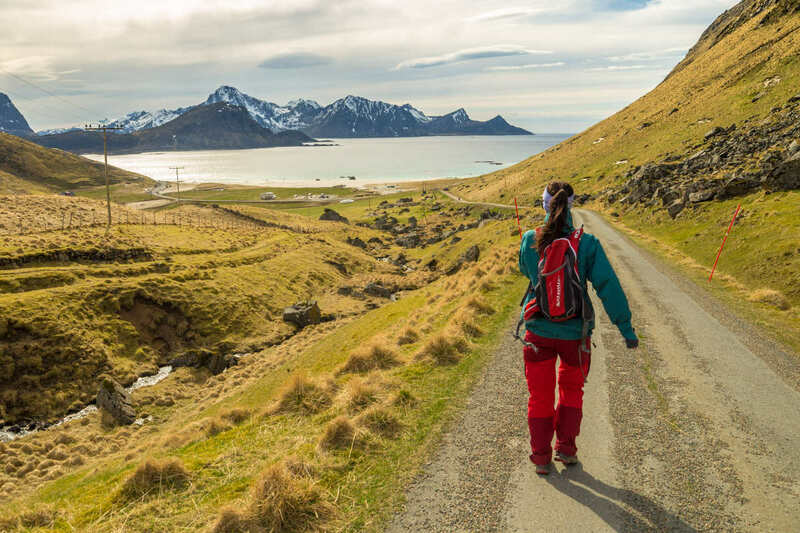 Typical walks are long summit trips with steep ascents on uneven paths. Can have precipitous and exposed sections where scrambling and climbing is necessary. Narrow ridges, smooth rock, scree etc.